I know it’s only October. But I am really excited about a new movie that’s coming soon from Sony Pictures Animation and Affirm Films. The movie tells the story of the first Christmas and is a well done, animated movie, that is fun, funny and full of adventure. The best part is there are no elves. It’s the real story behind the meaning of Christmas – the birth of Jesus. I believe this is a movie that is going to be a wonderful theatrical experience for the whole family. The official synopsis from The Star web site describes the story as follows. Check out what a few ministry leaders are saying about this new movie. I love that this is a Christmas movie that will open in November, because families can see the movie and then spend the Christmas season unpacking the messaging in the movie around the dinner table, during bedtime conversations, at church and spontaneous moments during the Christmas season. The Star represents a gift for humanity in the promise of the Savior Jesus. After seeing the film I would encourage families to come up with a few ways in which they can be a gift at school, work, family members or to complete strangers in their communities. 1- The 12 days of Giving; Establish 12 days of giving as a family and come up with different ways as a family you can be a gift and a blessing to someone in your community. 2- Make The Star cookies as a family and share them with a neighbor, a retirement center, a homeless shelter as an unexpected gift. 3- As a family, create some memories by making Star ornaments or a star tree topper for the family tree (see the video example below). 4- Continue to talk and discuss the story of Christmas as a family thru out the Christmas season and unpack ideas on how each person can be an example of a gift to their community. Check out the video below of an interview with the Executive Producer of The Star, Devon Franklin. Devon talks about the movie and why he decided The Star was an important story to share with the world this coming Christmas season. 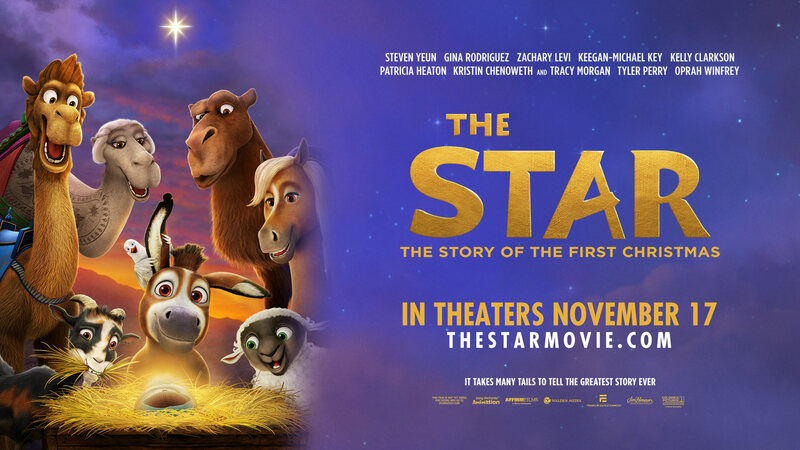 The Star opens in theaters November 17th. Mark your calendars and make plans as family to see the film to start the celebration of the Christmas Season. I once heard a story about a man who went to the beach and as he walked along the way he noticed hundreds of starfish and was so overwhelmed that he started to toss them back into the ocean one by one. After some time elapsed, a another beach comer came along and noticed what the man was doing with the starfish and asked the gentleman why he was wasting his time tossing the starfish back into the ocean. There are hundreds of starfish and there is no way that you will be able to save all of them. It won’t matter. The man than picked up another starfish and said, it will matter to this one and tossed the starfish into the ocean. This may seem like a small gesture, but there is and cause and effect to every action that we take and we may never know the effects of our actions that we take in life. It mattered to the life of one starfish and that mattered to the man walking on the beach. Everyone of us faces these same questions in life. Does it really matter what I do. Can I make a difference in my world, my community. Many of us don’t even bother to try and we wander through life without making an impact at all. Hacksaw Ridge is a powerful film that spoke to me on so many levels, but the one principal that stood out the most is that of obedience. The obedience of one man impacted the lives of 100’s of people for generations to come. You see, Desmond Doss rescued 75 men that would have otherwise perished in battle, Desmond single-handedly evacuated these wounded men from the battlefield behind enemy lines. WOW! After previewing the film, I wondered where the children, grandchildren and the great grandchildren of the 75 men are today? Do they know what happened and how the course that their lives might have taken a completely different route if it had not been for the obedience on ONE man’s actions – Desmond Doss? So the simple obedience of one man can impact the lives of hundreds of people. There is a cause and effect and YES you can make a difference. The POWER of ONE is real. Everyday we have a choice to be obedient, to be kind, to be generous and to be selfless. The power of your choices can impact one person and you never know have far reaching your choices will go. Hacksaw Ridge opens in theaters Friday November 4th. This is a movie that stays with you long after the credits roll. I encourage you do go see the movie, but be ready to be inspired, challenged and reminded of the POWER of ONE and also of the sacrifice’s that were made by the brave men like Desmond Doss in order to secure our FREEDOM. This film is Rated R for the war violence ( not suited for kids at all). Visit the Hacksaw Ridge web site for more information. 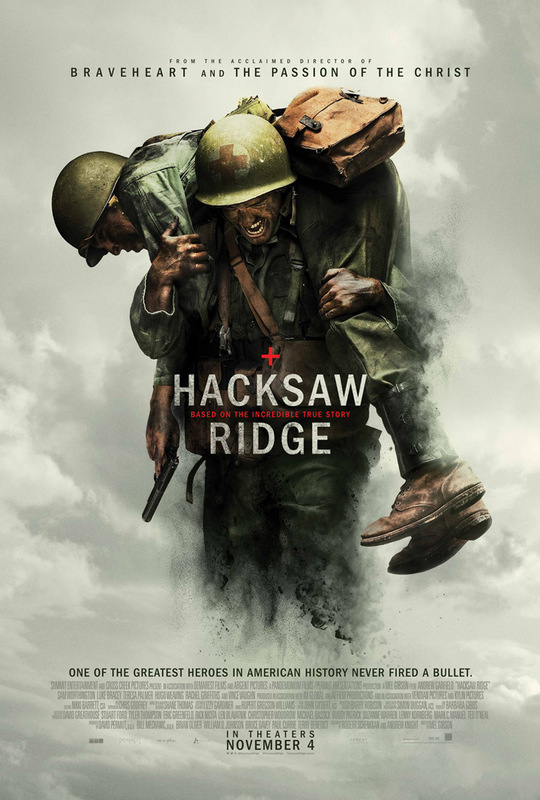 Synopsis : HACKSAW RIDGE is the extraordinary true story of WWII medic Desmond Doss, who, in Okinawa during the bloodiest battle of WWII, miraculously saved 75 men in a matter of hours without firing or carrying a gun. He was the only American soldier in WWII to fight on the front lines without a weapon, except the simple prayer he uttered before he single-handedly evacuated the wounded from behind enemy lines, under constant enemy gunfire and artillery bombardment. Doss’ courage and faith won the admiration of his commanders and fellow soldiers, as he saved the lives of the very men who had persecuted him for refusing to carry a gun. He believed the war was just, but to kill under any circumstance was wrong. Doss was labeled the first conscientious objector (he called himself a “conscientious cooperator” as he volunteered) to receive the Congressional Medal of Honor. From early on in my adult life I knew deep in my heart that my travels through Life would be a little different from ‘the norm’. I married later than all of my friends, started a family later, and then was blessed to have a daughter who happens to have Down Syndrome. We had the name ‘Grace’ picked out years before she came along (it is the meaning of my name) and appropriately it means ‘Gift’. For that is what Grace has been to our family. It has indeed been a Journey. Grace is now 15 years old and although we get to experience the tween attitude now, we would not trade her in for anything. IT IS OKAY TO TALK TO PEOPLE ON THE ELEVATOR OR IN LINE… We all tend to avoid eye contact or just stare straight ahead. Grace, however, loves to meet everyone and socialize with them. We have met so many strangers over the years because of her. WHEN PEOPLE ARE SAD, THEY JUST WANT TO BE HUGGED… She is always concerned when someone is crying or sad and wants to hug and console them. Personally, I have a tough time hugging others and do not always know what to do or say when someone is sad. Grace is teaching me that it is okay to embrace others more. IT IS IMPORTANT TO SAY “I’M SORRY” IF YOU HURT ANYONE… There were many times that Grace was the reason why other little girls (usually the emotional ones) would be crying. She went through a long stage of pulling hair when she was young. I think she was just fascinated with long, golden hair and would reach out to touch it, causing the owner to pull away in shock and get her hair tugged. Yet Grace always said “Sorry..” and would then try to hug them tightly. She did not make many close friends during this stage. PEOPLE ARE MORE IMPORTANT THAN TOYS… I have been asked multiple times what Grace’s interests or favorite toys are. It has always been people. She came out a social butterfly and chats away with anyone she engages with. However, she has also embarrassed me at times with her strong opinions. One time someone we met was so excited to get our girls together and Grace took one look at the daughter and said “I don’t like her!” They eventually did become friends, yet that was quite humbling. SOMETIMES WE JUST NEED TO STOP AND TAKE A NAP… Anywhere. Anytime. Enough said. IF YOU ARE SAD, JUST SAY “I AM HAPPY” AND FORGET ABOUT WHAT WAS UPSETTING YOU… Of my three kids, Grace gets over a foul mood quicker than any of them and flashes a smile to let us know that she is happy again. If only it was that easy for the rest of us! IT’S IMPORTANT TO WAKE UP EACH MORNING WITH A SMILE… Grace has always been a morning person and now that she is getting older we hear “what’s next?” a lot. This is tough when we have no plans or she is not excited about “what’s next”. Yet, unlike her older brother, she always starts the day in a great mood, ready to conquer the Day. WE ALL WANT FRIENDS WHO LOVE US AS WE ARE AND DO NOT STARE AT US IF WE MAY BE ‘DIFFERENT’… Being my social bug, Grace has made lots of friends over the years. Bless the ones who have patiently listened to her passing obsessions (over and over again). We all just want to have people listen to our hearts, don’t we? WE NEED MORE OF THE ‘OH, WOW SYNDROME’…That is what I call it when Grace is next to me one second, and then missing the next. What was so fascinating that caused her to say in her head “Oh, wow!” and then take off after it? This was not always logical and yes, we ‘lost’ her temporarily a few times in stores and in our neighborhood. Now she at least looks back at me like, “Oh, yeah..I’m supposed to check in with you first”. I need to look around more and find wonderful things that attract my attention. TO BE CONTENT IN LIFE IS A GREAT THING… There is a stereotype with these wonderful kids with Down Syndrome. The stereotype is that ‘They are always so happy’. Always happy? No. Content? Yes. I long to be content with what is going on in my Life, to embrace each day and each person I encounter and to be content. Grace has been a wonderful gift and is teaching us about living life with a different perspective as we move forward in our journey in life as a family. Here is a list of the upcoming films. I Am Not Ashamed – The Rachael Scott Story. Join hundreds of thousands of believers on April 20th, 2016 in theaters all across North America. On the 17th anniversary of the Columbine massacre, a new movie will share the true inspiring story of a high school student whose compassionate faith caused her to reach out to fellow students – including her killers. Woodlawn is a Movie For Such a Time is This! WOODLAWN arrives in theaters in one week and is ready to score BIG with audiences across the USA. WOODLAWN bows on an aggressive 1500 screens on Friday October 16th. WOODLAWN is an entertaining and inspiring story that is based on a true story. The film has an incredible cast that includes Jon Voight, Sean Astin, Nic Bishop, Sherri Shepherd, Caleb Castile and a few more. Click here for more info on the cast. I really enjoyed how the directors shot the film. They wanted the audience to feel like you are right in the middle of the football action.You really feel like you are apart of the team and as a result the directors give you a unique perspective from the huddle to the end zone. SYNOPSIS OF THE MOVIE: “A gifted high school football player must learn to boldly embrace his talent and his faith as he battles racial tensions on and off the field in WOODLAWN, a moving and inspirational new film based on the true story of how love and unity overcame hate and division in early 1970s Birmingham, Ala. I believe WOODLAWN lands in theaters for such a time as this. It does not take long to see that our world is upside down right now and something has got to change. As we look back in time, all the social engineering did not work in Birmingham and fast forward to today and it’s still not working. It was not the social engineering that brought change in Birmingham, it was a move of God that saved WOODLAWN high school and as a result had a deep impact on individuals, the school, the city and the state of Alabama. We need healing, unity, racial reconciliation and we need revival in our country. WOODLAWN is a story about a high school that was saved by a revival. It is a powerful story that does not need to stay in the history books, but it needs to happen again. Revival happened in Birmingham and it can happen again in your city!!! Check out the trailer for WOODLAWN and share it with your friends and make plans to see WOODLAWN on opening weekend October 16th! There is a new movie that opens today in theaters all across the USA. You may or may not have heard about it. This film broke records in April by using an ‘on demand” model to bring the film to theaters. Over 70k families all over the USA went to the film and loved the movie. As a result of the films HUGE success using a limited release model, Freestyle Releasing presented the opportunity to distribute the film in a traditional release on June 5th, 2015. That is today!! Beyond the Mask is the movie and it’s a revolution in faith- based film making. It’s full of action, adventure, romance and redemption. BTM is a wholesome and clean movie that will entertain from beginning to the end. There is no bait and switch in this film (no language and none of the rude and crude elements that find their way into many so called family movies). I would go as far to say this is a “must see” movie this weekend! This film has depth in the story and cast and takes you to the early years of the history of our country and the struggles that many faced in birthing a new nation. The sets and special effects are beautiful and simple amazing to watch. The cast includes Kara Killmer (Chicago Fire), Andrew Chaney ( Seasons of Grey), John Rhys-Davies ( Lord of the Rings) to name a few. See additional video interviews below. I am excited for Beyond The Mask and the success that the film is experiencing and with your support this weekend “Beyond The Mask” will continue to break records. So “take action” this weekend and go see “Beyond The Mask” at a theater near you! Check out the theater listings at Beyond The Mask web Site. New on Netflix – Veggietales In The House! I am excited to announce that Veggietales are coming to your house!! Premiering this Thanksgiving November 26, 2015 as a Netflix original series, it’s “Veggietales in the House”. According to the Netflix web site, “this all-new series and features the same characters you know and love, along with the same faith-based values and teaching you’ve come to expect from VeggieTales. We care about what young people are watching and are excited VeggieTales is launching this new series on Netflix that helps teach meaningful life lessons and makes children smile”. Check out the trailer below for a quick overview and there is also a link to hear some of the thoughts from the original creators Mike Nawrocki and Phil Vischer. It is good to see Phil still involved with Veggietales as the brand moves forward. Here is a link to 4 FREE coloring and activity sheets for the Veggietales fan in your house. A few word from Mike and Phil regarding the launch of Veggietales in the House. After you check out the trailer, let us know what you think. Do you like the new look and feel to Veggietales?